If you’re thinking about buying your first car, you’re probably weighing the pros and cons of both manual and automatic transmissions. 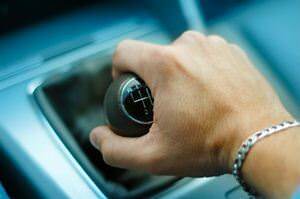 A manual transmission is a simpler and more affordable piece of machinery, but it requires that you shift the gears yourself. An automatic transmission is a bit more costly to repair, but it gives you the freedom to completely relax at the wheel. Regardless of whether or not you choose to own a stick-shift vehicle, it’s a good idea to know how to drive one. Life can present many situations where you might need to drive an unfamiliar car. What if one of your friends was drunk, and you needed to drive his car home? What if you were trying to rent a car in a foreign country, and the agency only had manual transmissions available? If you don’t know how to drive a stick shift, your options in life will be much more limited. Begin learning your gears by practicing with the car turned off. Push the clutch in each time you shift, feeling your way through each of the gears. The clutch is the pedal on the far left. You should use your left foot to work it and your right foot to work the gas and brake. Practice moving the shifter all the way into gear. You don’t need to force it, but you should push it as far as it will go. If you don’t push it far enough, you will hear a grinding sound. Put the car in neutral, press down on the clutch and start the engine. Leave the car in neutral while the engine warms up. Learning to operate the clutch is the most difficult part of driving a stick-shift car. Always avoid accelerating while the clutch is down. When idling at a light, shift the car into neutral. Upshifting is what allows your car to advance in speed. To move between first and second gear, take your foot off the gas and press down on the clutch. When the clutch pedal is down to the floor, shift up a gear and slowly take your foot off the clutch while pressing down on the gas pedal. This will seem confusing at first, but with enough practice, you won’t have to think about it much. The process becomes intuitive. If you want to downshift the car while driving in fourth gear, push down the clutch, hit the brake and shift downward. Release the clutch slowly. Repeat these actions to move down to second gear. Using the emergency brake is important when parking a stick-shift vehicle because these cars don’t have a specific gear for parking. This means that if you don’t engage the brake, the car could potentially roll away. It’s difficult to learn how to operate a stick-shift while reading the instructions on paper. This article may help you learn the basics, but you will still probably need to do a great deal of practicing before you feel comfortable driving with other cars on the highway. Consider practicing on a country road, long driveway or some other area where you won’t have to worry about traffic.